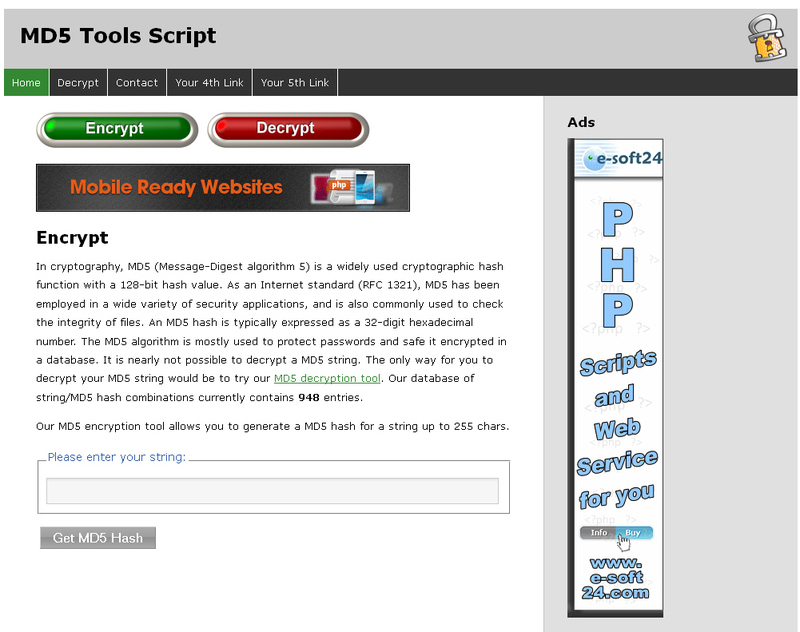 With this premium MD5 Tools Script, you can offer your visitors very usefull tools to encrypt or decrypt data strings. The MD5 (Message-Digest algorithm 5) is a widely used cryptographic hash. It is often used to save sensitive data like passwords in a database or anywhere else. The MD5 Tools Script collects all its generated hashes and this way the php script can decrypt MD5 hashes, which is normally not possible. Run this script as a standalone site, offer the MD5 Tools to your existing website visitors and they will come back for more, or simply use it for your own needs! As the script comes with easy ad and link integration, you can also easily make money with it.